He’s a decorated Olympian whose natural habitat is slap-bang in the middle of a competition. 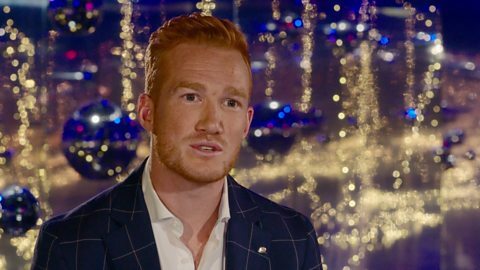 Greg Rutherford is more than ready for Strictly! "I'm looking forward to the spray-tan if I'm honest. I've been pasty all my life"
Born in Milton Keynes in 1986, Greg was one of three kids. Sport was always very much in his blood – his great-grandfather played for England, and Greg himself had trials for Aston Villa. But the lure of the long jump had a greater pull than that of football, and he became the youngest ever winner of the AAA Championships at just 18. It was London 2012 that saw him truly leap into the limelight, with his gold medal-winning jump making up a crucial part of the now-infamous Super Saturday. Four years on, he did Team GB proud yet again, taking the bronze in Rio. Thankfully, he goes get some downtime, but Strictly is eating into that: "At this time of year I normally completely switch off for six weeks," Greg explains. "I stay at home a lot sitting around in my pants eating cakes because I don’t really get to do that the rest of the year and this is going to be one of the first years in a long time that I’m training through." Clearly, Greg loves a challenge, further proven by the fact he's competed in the Great Sport Relief Bake Off and the Channel 4 immersive history series Time Crashers, as well as celebrity editions of The Cube and Million Pound Drop. With Olympic gold and bronze, European Championships gold and silver, World Championships gold, Commonwealth gold, an MBE and even a 26ft tall statue erected in his honour, Greg’s already got quite the collection of metallic awards. How d’you reckon the Glitterball Trophy would look alongside that little lot?